Pet vaccinations are the best way to protect your pet against highly contagious illnesses, including parvo, distemper and rabies. Our Toledo veterinarian strongly recommends the core vaccination series for all pets, along with rabies vaccination. Dog and cat vaccines can not only save your pet’s life, but also protect your family members, especially younger children, from contracting rabies. The canine core vaccination (DHPP) is a combined shot protecting against distemper, hepatitis, parainfluenza and parvovirus. For felines, the core vaccination series is the combined FVRCP vaccine, which protects against feline viral rhinotracheitis, calicivirus infection and panleukopenia. After a pet is vaccinated, regular booster shots are necessary to maintain immunity. Depending on which vaccination is administered, a booster shot may be necessary every one or three years. In addition to core vaccinations, your pet may benefit from additional vaccines. For example, dogs that frequently visit dog parks, grooming salons or boarding kennels should also be vaccinated against bordetella (kennel cough) and leptospirosis. If you have a cat that has tested positive for feline leukemia, we may recommend vaccinating your other cats against this virus in order to prevent cat-to-cat transfer. Our Toledo veterinarian works closely with pet owners to determine the right vaccines for their pets’ lifestyle and wellness needs. As part of our commitment to proactive veterinary care, our animal hospital offers the puppy/kitten vaccination shot series. This vaccination series should generally begin around 8 to 10 weeks of age, with booster shots being administered every 3-4 weeks until your pet is 18 to 20 weeks of age. We will administer the core vaccination series (DHPP for canines and FVRCP for felines) as well rabies and additional vaccines based on your pet’s wellness needs. The puppy/kitten shot series is important because a young animal’s immune system is still developing. 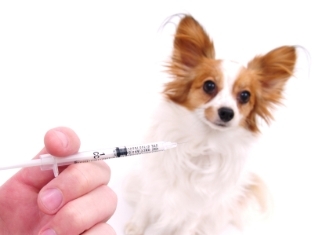 Without regular booster shots, your pet could easily contract a deadly disease. Pet vaccinations are a safe and effective way to protect your pet from serious illness. However, we understand that some pet owners may worry about the safety and effectiveness of vaccinations. Like any medication, there is always a small risk for an allergic reaction. However, the chance of an allergic reaction is extremely low. In fact, there is a far greater risk that your unvaccinated pet will contract a life-threatening illness without vaccination protection. Even with advanced veterinary care, it is not always possible to save a pet that becomes seriously ill. Emergency care can also be incredibly expensive. Pet vaccinations are a safe, affordable way to protect your pet’s well-being. When your pet is healthy, your entire family is also healthy. Our animal hospital strongly encourages all pet owners to make pet vaccinations a top pet wellness care priority. Should you have questions about your pet’s vaccination history, need a copy of this history for boarding or doggy daycare, or simply wish to learn more about vaccinations, contact our animal hospital care team.